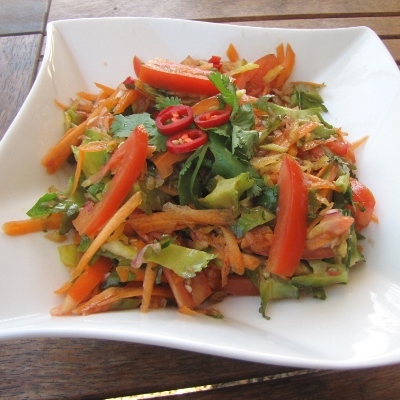 This salad is crunchy with a Thai twist. Shake all ingredients in a jar to blend. Making the salad is really easy. Bring a small saucepan of water to the boil. Throw in the sliced snake beans for only 30 seconds to blanch them. Quickly drain them in a colander and run cold water over them to cool. Toss the bean slices into a serving bowl. 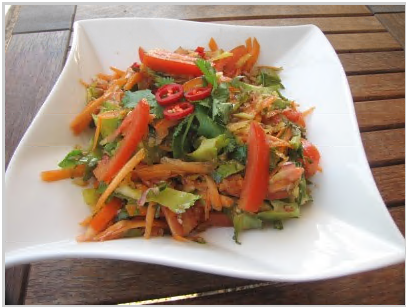 Combine the remaining salad ingredients- carrot, tomatoes, capsicum and celery. Pour prepared Thai dressing over the salad and it’s done.